Helping an HVAC company grow their business, while setting a new standard of service in the crowded Kansas marketplace. 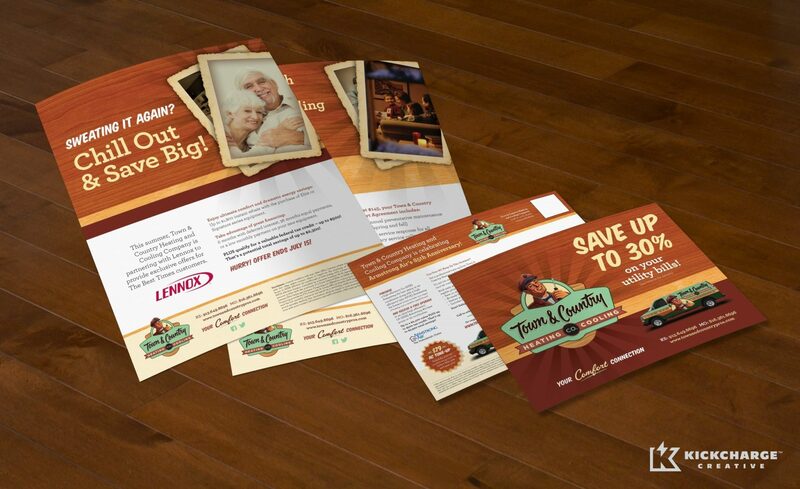 Town & Country Heating & Cooling approached us with the need to rebrand their business, so they could stand out and make a memorable impression on their target demographic. As a start up HVAC company in Lenexa, KS, Town & Country was competing against others in their industry that already established themselves to home and business owners. They needed unique branding and sales tools that would differentiate them from the other HVAC companies in Lenexa, Kansas, and the surrounding area. 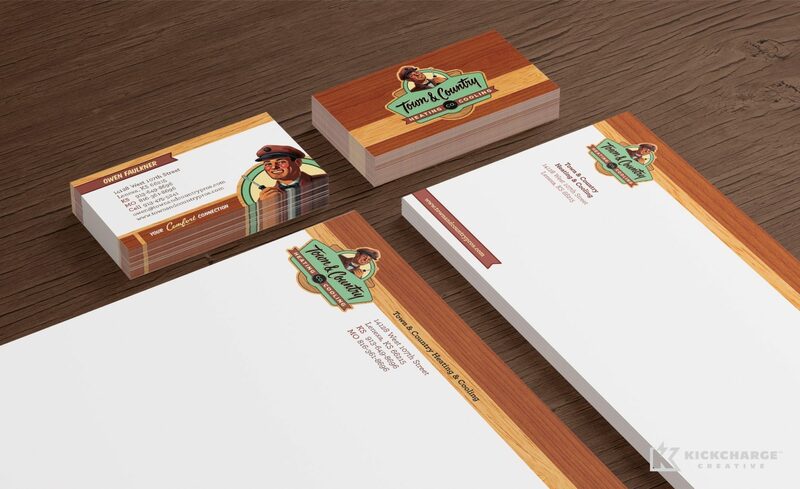 For an HVAC company that strives to earn 100% satisfaction with every visit, they needed a brand that reflected a trustworthy time—something right out of the retro-era. That’s why we chose to place a heavy emphasis on Town & Country’s “value you can hang your hat on, and service that will make you smile,” with a retro mascot. To bring Town & Country’s premium value and service to light, KickCharge Creative chose a retro mascot that exuded trust and reliability. We felt that a logo and brand reminiscent of old-fashioned 1950s values would be the best way to demonstrate quality, while fostering consumer confidence. With the use of fonts that evoke mid-century-style script, we communicated reliability and excellent service to their customers. KickCharge Creative incorporated Town & Country’s new branding onto their vehicle wrap designs, website and various sales tools. Individually, these marketing components tell the Town & Country brand story—but all together, they give the impression that this larger-than-life brand represents a larger-than-life company. 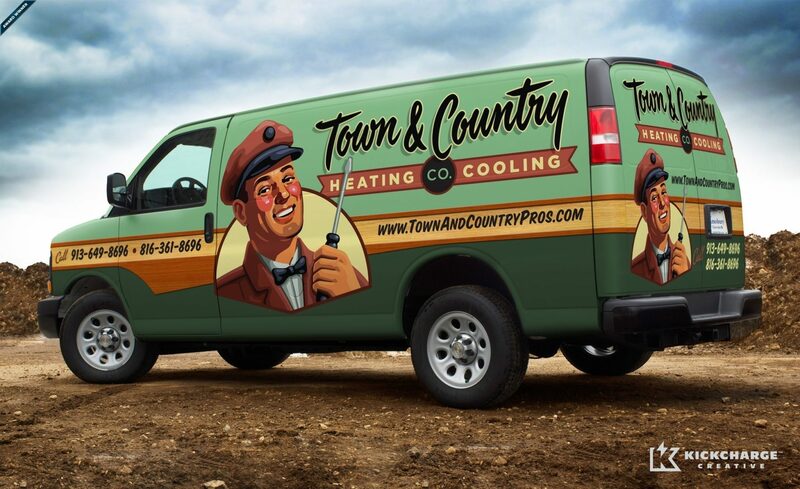 After the rebranding and rollout of Town & Country’s new brand, this HVAC company was armed with the proper brand and marketing tools to outshine and out-deliver any competitor. Since the start of Town & Country in April 2013, the company has added three full-time service technicians—with another few on the way.